Although the last exclusively-branded New Home sewing machine rolled off the assembly lines in 1955, you can still find these desirable machines at antique stores and flea markets, and they are also available on auction sites like Ebay. Many seamstresses and quilters enjoy sewing on these beautiful antique machines. New Home began as a very small sewing machine operation with combined assets of only $350. Eventually it became a very successful company, with a huge factory employing over 700 people. According to the International Sewing Machine Collectors' Society (ISMCS), at its peak in 1906 and 1907, the New Home factory churned out 150,000 sewing machines each year. New Home made both hand-crank and treadle machines, purchased primarily for home seamstresses. The ISMCS estimates that there were 7,000,000 New Home sewing machines in operation by the 1930s. One of the greatest American sewing machine companies began as the vision of two men: Thomas H. White and William L. Grout. Both were working in the chair manufacturing business and noticed that the sewing machine was fast becoming a popular tool for the American seamstress. They set out with a $350 investment, three employees, and a 100-square-foot shop, to manufacture a quality, hand-operated sewing machine that would sell for only $10. It was called "The New England." When the company began to succeed, Grout dissolved the partnership and set out on his own. White formed another partnership, expanded operations, and built a very successful business producing what was now called the "New England Family Sewing Machine." White later went on to design, manufacture, and market the very popular White sewing machine. William Grout, the original partner of Thomas White, returned to the scene in 1878 as general manager and president of the New Home Sewing Machine Company. According to the ISMCS, Grout's name appears on many of New Home's patents, and he was often the sole inventor of new sewing machine technology or manufacturing equipment developments. He continued as the factory superintendent until 1900, and at the time of his death in 1908, he was a millionaire. New Home went into substantial debt in 1918 by purchasing the stock of a furniture company in order to ensure the supply of woodwork needed for the sewing machine cabinets. The debt proved to be too much, and New Home struggled throughout the 1920s. 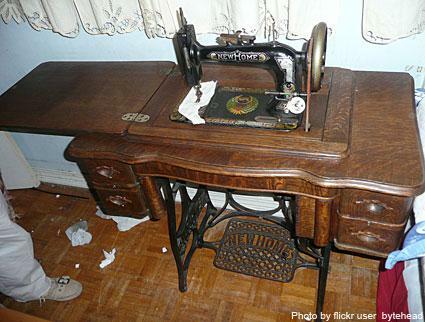 In 1928, the Free Sewing Machine Company took over the operation of New Home. They continued producing machines under the New Home name through 1955. Today, Janome owns the New Home brand, and some of its models also feature this name. During its long history, New Home produced many different styles of sewing machines. From the simple hand-crank models to the more complicated treadle machines, a few stood out for their significance or popularity. Some of the oldest New Home machines operated using a hand crank. These models were small enough to sit on a table or desk, and they featured a carved wooden base. A crank on the right side of the machine drove the needle up and down. These machines are quite rare and valuable today. The New Home Number Four featured a beautiful cabinet with drawers and a velvet-lined wooden case. The machine operated using a food treadle, and it was heavily ornamented and plated with nickel. You may see the Number Four for sale at antique stores or flea markets. Produced in the early 1900s, the Parlor Cabinet Treadle was a self-contained sewing machine with its own storage cabinet. When the sewing machine wasn't in use, a crank lowered it into the cabinet, which looked just like any regular piece of fine furniture. When the home seamstress was ready to sew, she simply opened the cabinet and turned the crank to raise the machine. The treadle was inside the cabinet, along with several drawers. The type of machine - Is it hand crank or treadle? The dimensions - Measure the machine's height, width, and depth. Identifying features - Does it have any numbers or marks on it? If you decide to purchase an antique New Home sewing machine or have one that you've inherited from a relative, you can find instruction manuals at the ISMCS website. The high quality of these vintage sewing machines means that with proper restoration and maintenance, many of them are still usable today. In fact, these simple machines make great tools for kids or beginning seamstresses or quilters.